I am super excited about today’s post because it comes from my friend and fellow cookie decorator, Hana Bacova, who I affectionately call Hani. Her specialty, traditional Slavic honey cookies, or Medovnícky, is what first drew me to her work. I have always been very interested in this beautiful technique so I am very excited for Hani to be sharing with us today. Enjoy! Hello! My name is Hani and I write a little blog called Haniela’s. I met Callye several years ago via Flickr and we’ve been friends ever since. Though we’ve never met in real life I know if given the opportunity we’d have a lot to talk about. Truth is Callye asked me to do a guest post some time ago. A long time ago to be exact! I somehow got stuck with ideas, I wanted to have something cool to share with her readers on her popular blog, I even had things I actually made and wanted share with the readers but you know that little guy inside of my head was saying : not good enough , not worthy etc. I know it sounds pretty sad as I’m a grown woman but you know how it is, I was just a tiny bit intimidated, thinking how can I live up to Callye’s expectations? Have you seen her COOKIES!!!??? Amazing right! Nevertheless, I’m here today and I’m ready to share something with you.I hope you like them. Today I decided to share with you my Honey Cookies. Some also call them gingerbread cookies; we call them Honey Cookies, (I’m kind refusing to change that name) These tasty cookies are very much traditional to parts of the Europe. Honey Cookie making developed centuries ago, when first honey breads where made, later spices were added and now all these years later, we’re still making Honey Cookies. I’m from Slovakia, and tradition of Honey Cookies is still going strong. We call them Honey Cookies because honey is added to the dough. To view my recipe, click HERE. Traditional style of decorating is very time consuming, I don’t decorate this way too often , though I love the look of lace like patterns. It takes up so much time, I make these only for very special occasions. If you would like to see me in action, click HERE to view my video. 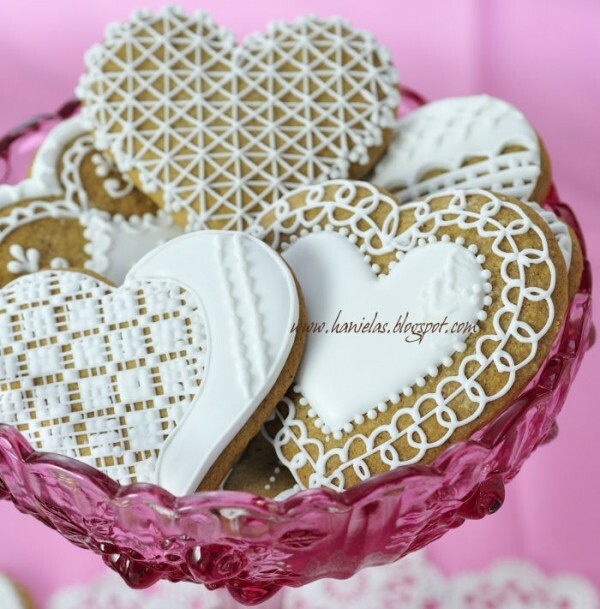 Today I prepared for you a collection of Heart Cookies, they are different shape and sizes, I hope you won’t mind but it is nearly impossible to do a picture tutorial because there is a lot of details involved, still I hope you’ll enjoy viewing these. 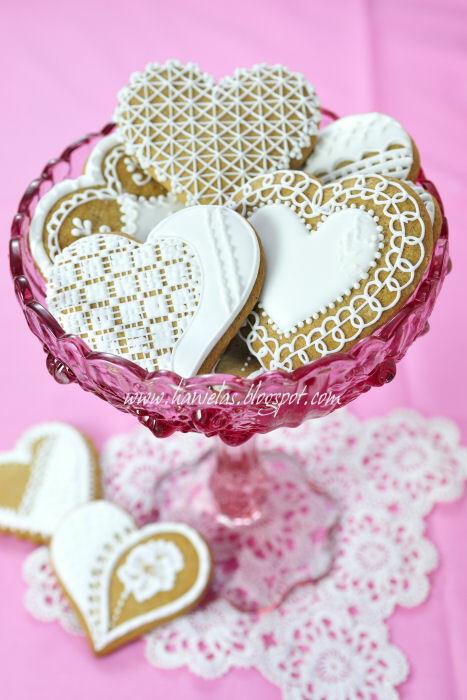 These hearts are mostly very traditionally decorated with lace designs and some dots, swirls and such. When decorating I use a small sandwich bag and I make a little opening in the corner to pipe. 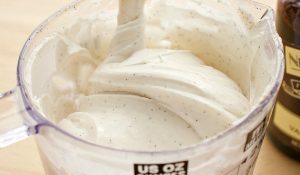 I use Royal Icing made with meringue powder, in Slovakia raw egg whites are still wildly used to make royal icing. Consistency of icing is extremely important with these and sometimes it takes more then one try to get it right. I decided to do white on white because that is what I’m accustomed to though different colors are becoming more and more popular when decorating these delicate cookies. Cookies on their own taste delicious, they are excellent with a cup of tea or coffee, great to take along to a picnic, ski trip or as part of the school lunch.They will last for 4 weeks or longer if properly stored in an airtight container. Honey cookies usually become hard after they cool, right after baking. this is normal, they will soften within a few days when stored in the airtight container, you can also help soften them by placing a piece of an apple in the container, or a piece of a bread. Replace bread or apple frequently. You can find more delicious treats on my blog or you can keep up with the updates via my Facebook Page too. I’d love to see you there, don’t be shy, stop by and say hello. Truly beautiful, Hani!! Made with love! I simply LOVE your work. It is so sweet, perfekt and very vel done. Thank you for the insprations and for this wonderful blog.. These are beautiful! I could look at Hani’s cookies all day. Her piping skills are out of this world!!!! Oh my! They’re unbelievable! Even more so that she used a baggie! Wow! 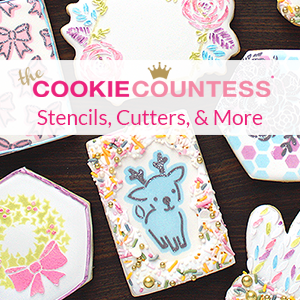 It is so fun to see Hani here – she is one amazing cookie decorator/artist. I am just always so amazed at what she puts out!!!! Such talent, such a sweet person. I can only IMAGINE how long those took to decorate! They are just gorgeous! So beautiful!! My husband’s family is from croatia and at the market (the outdoor plaza kind) there is a line of ladies sitting at a long table making lace. It looks exactly like your cookies!! Thanks for taking me back there! Great post, I enjoyed seeing at those master pieces, and know a bit more of your traditions Hani Congrats to both C&H!! 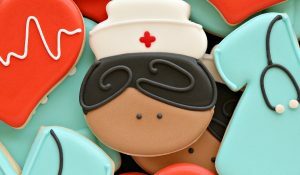 The detail on these cookies is STUNNING! Thanks for sharing. 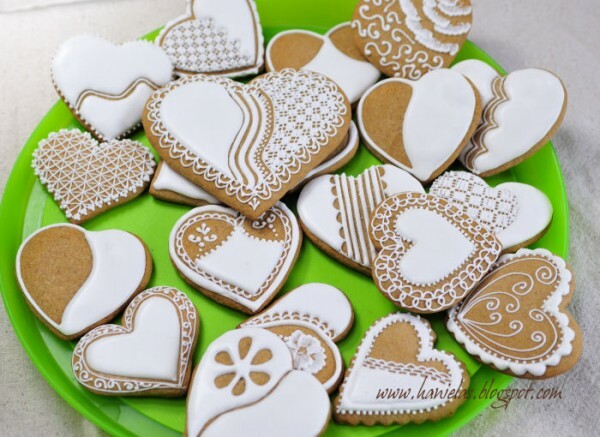 Your cookies are absolutely beautiful Hani and your piping skills are astounding. 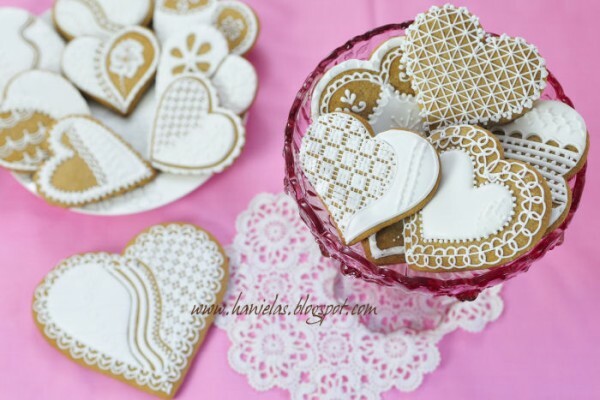 I am blown away that you manage to do such intricate work with a small sandwich bag filled with royal icing! 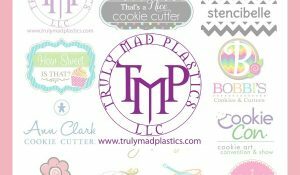 Thank You Callye for letting me cover and share on your beautiful blog and thank for you the wonderful compliments. I really enjoyed making these for the post.? Gorgeous! Don’t ever let your inner voice psych you out again!! Oh my Hani, these are exquisite! I admire your work so much! so beautiful and intricate! How you did this with a sandwich bag boggles my mind! AMAZING!!!! I’m going to have to try the honey cookie recipe. 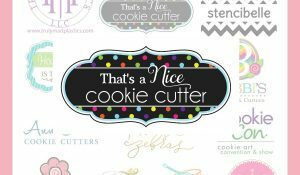 I’ll probably have more success in the cookie recipe than trying to pipe like you! 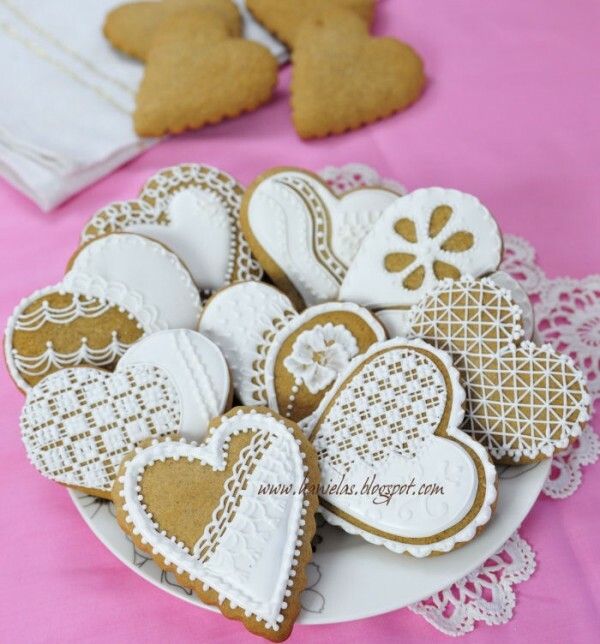 These are so gorgeous and elegant – you must have the world’s steadiest hands to do that piping! Hani your cookies are always gorgeous and incredible. The intricate piping is beyond incredible. Callye’s cookies are always over-the-top amazing, but that doesn’t distract from your own style and your own beautiful way of cookie decorating. I’m glad you were able to make a guest post for Callye and I’m sure she appreciates it. Thanks for sharing! All I can say is Stunning!! I can’t even imagine the time it takes to do the details!! BEautiful, but how you decorate it? Thank you so much everyone for such wonderful comments and compliments. Very good idea, lovely recipes. Fantastic cookies. Masterpiece. I love laces on your cookies. I pinned these b/c my boyfriend is very into his Slavic background, and I’d love to make these for him. I hope mine turn out as beautifully as Hani’s! I will miss all these beautiful cookies when I’m abroad, but it will be so awesome to catch up on all the wonderfulness when I get back in 3 months! Thank you for your kind words and your prayers that you left on my blog. It means so much to me, and I was so excited that you paid me a visit!! 🙂 Made my day! Until I return, Happy baking and decorating to you, Callye! Who are you… these are beautiful! A lot of patience went into these cookies! Such impressive artistry! Your line work and attention to detail leaves me in awe, Hani! I wouldn’t want to eat these, I’ll just be keeping them in a cookie tin and watch them whenever I feel sad!